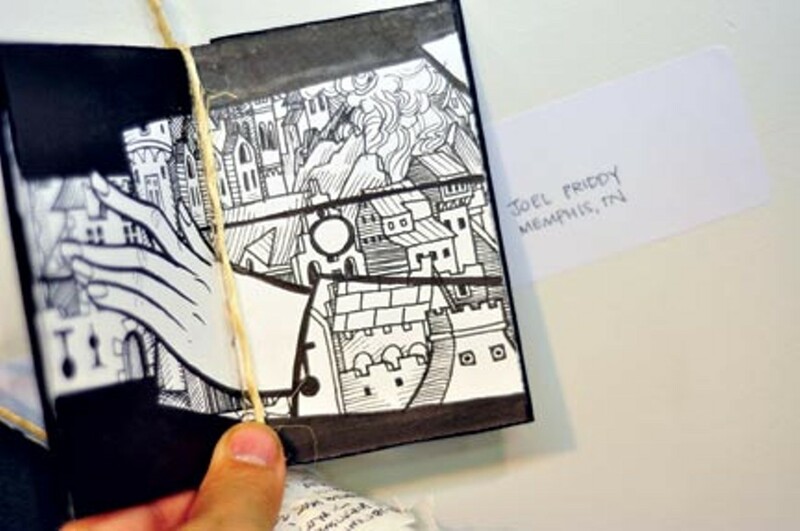 Artists' guild seeks Memphians to fill sketchbooks. 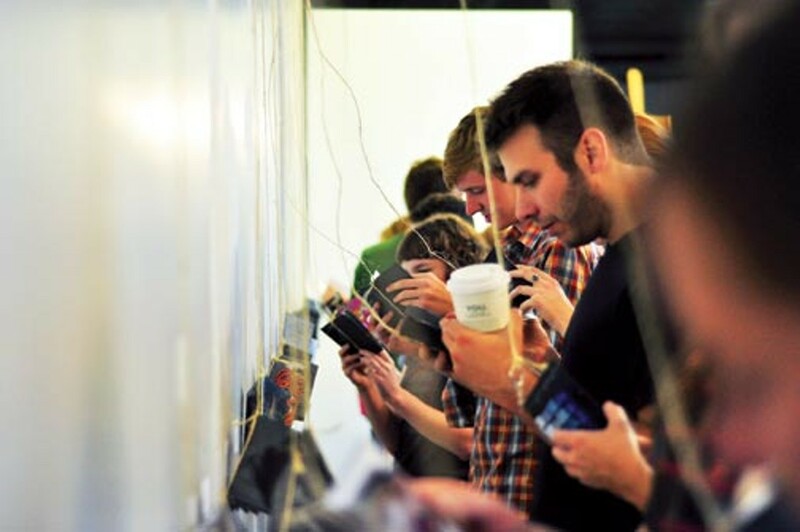 Gallery-goers check out sketchbooks at last year's show. The Rozelle Artists Guild will soon begin distributing mini sketchbooks to anyone willing to fill them with sketches, musings, and whatever else will fit within the 16 pages. Guild member Derrick Dent first came up with the idea for "Project Sketchbook" three years ago, after creating handmade books to pass the time at his Art Center job. He suggested to other guild members, a group of five Memphis College of Art students and alumni, that they distribute the books throughout the city. "We sewed two or three hundred of these little books," said guild member Lauren Rae Holtermann. "We gave them to everybody we could think of." The notebooks were returned with everything from shopping lists to tiny paper sculptures. Seventy-five sketchbooks were returned and displayed in the "Project Sketchbook" art show in the first year and 100 in the second year. "We keep getting a better response every year," Holtermann said. "I just think it's going to be getting bigger and bigger." In the past, guild members have set up camp at Otherlands Coffee Bar to distribute sketchbooks and answer questions. While Holtermann said they may do some of that this year, they're also bringing back their direct mailing technique: Request a sketchbook online, give them an address, and mail the book back in the pre-addressed envelope when you're finished. Holtermann said Project Sketchbook is a way for the Rozelle Artists Guild to engage with the community, giving entrants who have never been in an exhibition or gallery a chance to see their work on display. "The whole point of the show is that you don't have to be an artist. You don't have to be good at drawing. You don't even really have to try that hard," she said. "If you fill out a sketchbook and send it to us before the deadline, you're in the show." Once the sketchbooks are collected, the guild members string them up by their spines so visitors can hold each sketchbook in their hands. "People can pick them up and look through them, and that's really what we want people to do. I think the cool part of the show is the intimacy of getting to look through somebody's tiny sketchbook," Holtermann said. In addition to the show, which will take place in March, guild members put together a catalog of their favorite pages from each sketchbook, along with the names of participants. In past years, the catalog was also a way to thank sponsors. This year, however, guild members are trying to lean less on sponsors, opting instead for a micro-funding campaign on IndieGoGo.com. The website allows "Project Sketchbook" supporters to donate anywhere from $1 to $1,000 toward the $2,000 budget, which covers supplies for the sketchbooks, gallery rental fees, and postage for direct mailing. Last year, the guild charged $1 per sketchbook to cover postage costs; this year they're making participation completely free. As of press time, the project had only garnered $676 of its $2,000 budget. But with 26 days left, Holtermann remains hopeful. To donate to "Project Sketchbook," visit indiegogo.com/projectsketchbook. Andrew Ticer and Michael Hudman on their new cookbook, Collards & Carbonara. Babalu fills in another Overton Square spot; Muddy’s to open on Cooper. The historic Magevney House will soon reopen to the public.